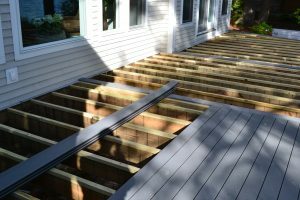 Redoing a deck doesn’t necessarily mean having to completely remove the existing deck and replacing it. 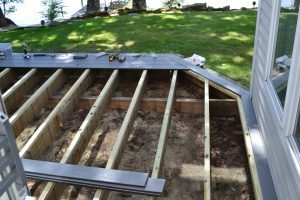 If the deck framing is still in good structural shape replacing a deck can be limited to just a deck resurfacing project. This was the exactly the case for us and what saved us from having to spend an even much greater sum of money to restore our deck to its original beauty. Late last summer my wife and I began contemplating redoing our deck. The existing deck had 2×6 pressure treated lumber for decking boards and the solid stain was peeling off all the time. Every time we walked into the house from the deck we were bringing in bits and pieces of deck stain. Also, some of the decking boards were beginning to show signs of rot. This was due to the fact that the decking boards had not been properly installed. The deck boards had been insufficiently spaced when they were installed, and after the deck boards had swelled from moisture there was virtually no gap left between the deck boards. This caused water to sit on the deck boards until it evaporated, versus draining off. So, when early fall hit last year we decided it was the perfect time for redoing a deck. Originally, I wasn’t sure if fully replacing a deck was going to be needed, or just resurfacing it with new deck boards would be all that was required. My hope was to redo the deck by simply resurfacing it with Trex decking. 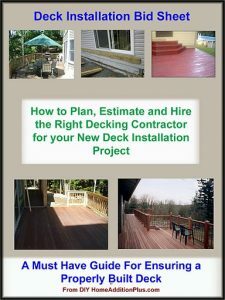 I called three contractors to come out and take a look at our deck and to provide us with quotes. After about 2 weeks we finally received quotes from all three contractors. Fortunately, all three deck contractors had come to the same conclusion that the deck structure looked in good shape and that most likely all that would be required for redoing our deck was replacing the deck boards. Albeit, they left wiggle room in their contract proposals that the deck replacement costs could go higher if there was unforeseen structural damage to the deck framing observed after removing all of the old 2×6 pressure treated decking boards. The quotes for redoing our deck ranged from $9,000 to $12,000 and each was limited to just a deck resurfacing project using Trex decking material. Our deck is quite large. It measures 40 feet by 16 feet. In addition, we wanted an apron put around the deck and all three deck landings resurfaced with Trex decking material. Thus, why the quotes were so high for just resurfacing our deck. After reviewing all the quotes carefully I chose the deck contractor who came in at around $10,000. Not only had his quote been more thorough, but he had also spent a lot more time with us when he first came out. He had explained to us a few ways in redoing our deck surface so that it would be more aesthetically pleasing. In particular, he had recommended bread-boarding around the perimeter of the deck to give the deck a more aesthetic look. My wife and I liked his idea. We also felt like from that lengthy first meeting that he really knew what he was doing, and most importantly, cared about his work. So a couple of weeks later he and his crew came out to our house, a total of four guys, and they began the task of replacing a deck surface for us. After about half a day they had removed all the old 2×6 pressure treated deck boards revealing a well preserved deck frame. Thus, we knew then that our costs for redoing the deck were not going to go any higher. A big relief. Also, to save costs, I had agreed to haul all the old deck boards to the dump. This saved the contractor time and the cost of renting a large dumpster. I had a large trailer and I placed all the old deck boards into the trailer as they removed them from the deck. After removing all the old deck boards the guys immediately began the task of resurfacing the deck with the new Trex decking material. It only took an additional three days for them to completely wrap up the project. The transformation of our deck was incredible. Not only were my wife and I thrilled about its new appearance, we were also elated with the fact that the maintenance on it going forward would be very minimal. 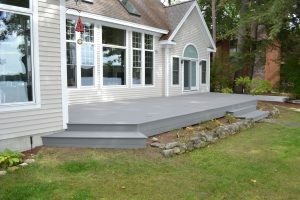 So, if you are contemplating redoing a deck, take comfort in knowing it may not cost you as much to do as you may think. If we had had to replace our entire deck, it would have cost us roughly twice as much. 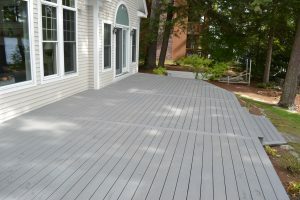 In the end, it cost us $15.63 per square foot to replace our deck surface with Trex Select deck boards.